Our Egg Platters are served with Hummus, a warm Pita, and your choice of 3 Toppings, one Side and one Sauce. 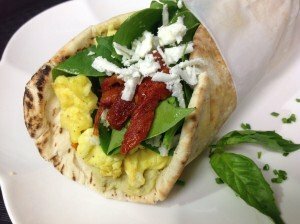 Scrambled Eggs, Hummus, Fresh Spinach, Sautéed Sun-Dried Tomatoes, Feta Cheese, Saca’s Pesto Sauce in a warm Pita. 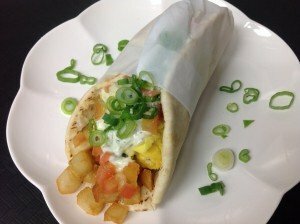 Scrambled Eggs, Hummus, Fried Cubed Potatoes, Diced Tomatoes, Saca’s Tzatziki Sauce, Green Onions in a warm Pita. Brewed with roasted Cinnamon sticks, Cardamom Pods, Cloves, Sugar, served with Whipped Cream and Rose Syrup. A selection of fine teas with and without caffeine. Green Tea brewed with Fresh Mint Tea. Made Fresh Daily.